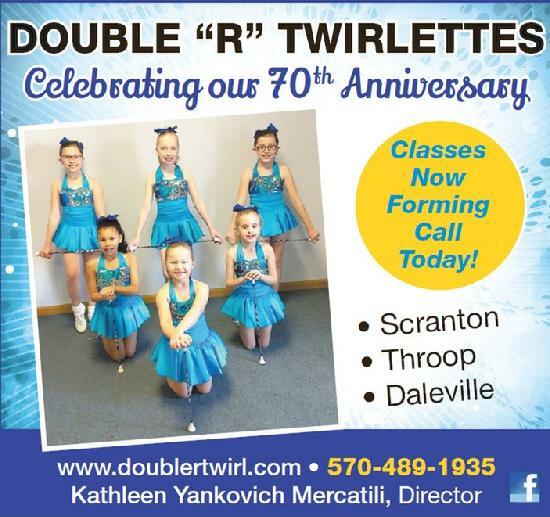 "A Baton Twirling Tradition in Northeastern Pennsylvania for 70 Years"
The Double "R" Twirlettes offers quality and professional training to students ages 4 years old and older in all phases of baton twirling, dance twirl, novelty twirl, marching/parade routines, two and three baton, and pom-pom. Students are taught the fundamentals of baton twirling as they learn proper twirling techniques. Twirls are incorporated with dance steps and music to enhance coordination, poise, and skill. The importance of self-confidence, sportsmanship, and teamwork are also stressed to make students more well rounded individuals. All students have the opportunity to participate in local parades and performances, as well as the group’s annual recital, twirl-a-thon, and summer performance vacation. Holiday parties, awards banquets, and other special activities are scheduled throughout the season to make lessons more enjoyable for all. Students with previous baton twirling experience are welcome to join the group’s performance corps. Private lessons are also available. Classes in Scranton, Throop, & Daleville! Watch news stories about our 40th annual twirl-a-thon! Watch news stories on our 2018 twirl-a-thon to benefit St. Josephs Center! See us at the St. Joseph's Center telethon on WNEP as we presented a check for $2,456.00 which were the proceeds from our annual twirl-a-thon. Watch us on WNEP-TV 16 as we say "Good Morning Pennsylvania"
See us at the St. Joseph's Center telethon on WNEP as we presented a check for $3,192.00 which were the proceeds from our annual twirl-a-thon.